When I ordered my MINI60 Antenna Analyzer from China I knew it was going to be quite a while in the post so I used the time to write some software for it to run on my laptop. 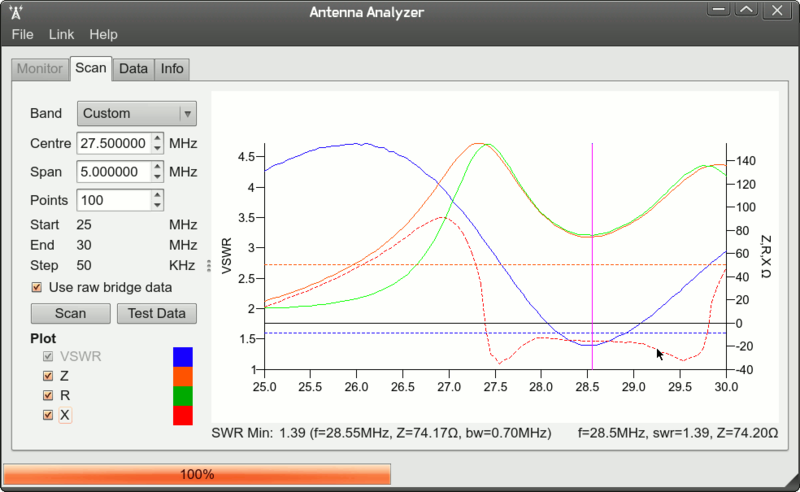 Now I only run linux on my PCs so I wanted something native, and this is the result - graphing software for SARK100 Antenna Analyzer (and clones like MINI60) for the linux platform. This program (v0.9.9 onwards) should build on MAC OS thanks to patches & testing from Adam Coddington. This may also work on windows with a little tweeking in the serial functions, since I used native linux/posix serial handling for all sorts of reasons. It's free, but no support is offered. It's a bit of a work in progress but it is working ok for me. Plug the analyzer into a USB port on your PC, turn the link on (on the MINI60, I press "set" then "down"). If your USB is not /dev/ttyUSB0 then use the link menu to select the right serial device. You WILL need to build from source as I m not supplying any binaries at present. analyzer-v0.10.13.tar.gz - fixed result parsing errors. Added experimental monitor tab. analyzer-v0.9.9.tar.gz - fixed data grid rowcount problem. Merged changes for OSX. Minor code cleanups. analyzer-v0.9.8.tar.gz - uses raw bridge data for smother results, turns off DDS at end of scan. Max swr setting on graph. analyzer-v0.9.6.tar.gz - fixed issue where it would not build on QT>=5.2 due to deprecated QString::toAscii().